Life as a Certified Registered Nurse Anesthetist (CRNA) is filled with challenge, opportunity, and reward – variability that makes each work day extremely worthwhile. 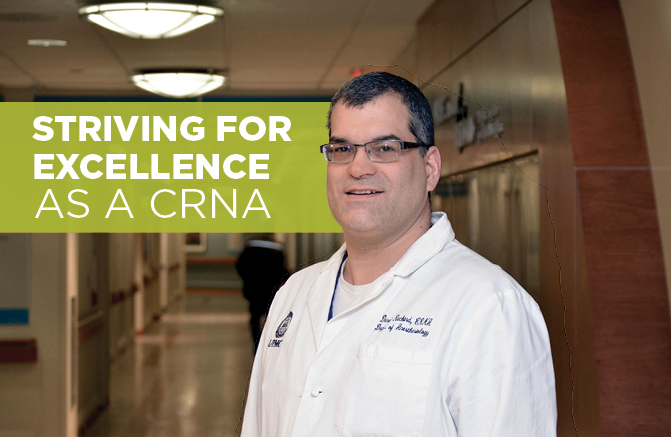 Derek Reckard, a CRNA at UPMC Presbyterian, finds the high-volume excitement of working in a Level 1 Trauma Center to be thrilling for these very reasons. As is the case for many people, it took me some time to discover my dream profession. Though I had always enjoyed the sciences in high school, I didn’t know which direction to turn, or career to pursue. When a friend prompted me to attend nursing school, I decided to give it a go. I haven’t looked back since! Graduating with my Diploma in Nursing and finishing my Bachelor’s degree, I started my professional career in the ICU, and even served a stint as a Flight Nurse. Though this was excellent experience for developing my nursing skills, I slowly felt myself growing complacent – I was ready for a new challenge! Based on my education and experience, a career in Nurse Anesthesia seemed like a logical next step to take. I especially liked the scientific aspects and excitement that this path promised. Now, having advanced in my role as a CRNA, I can’t imagine doing anything else – I’m passionate about this vocation! The day I discovered the difference I could make in someone’s life, I knew I had found the right profession for me. UPMC Presbyterian’s Level 1 Trauma Center provides the challenge and continued learning experiences that I crave – I love not knowing what each shift will hold! While some days are filled with routine anesthetic care, there are many days when I am called upon to care for trauma victims, with only a moment’s notice. Since we seek to offer the highest level of care available in the region, we strive to never say, “We can’t handle that – the patient must be transferred.” As a member of both the Trauma and Transplant and Neuro and Cardiac anesthesia teams, tackling difficult cases requires me to think fast on my feet and be well-versed in the best available treatments and medications. While my position seems to overflow with opportunity, an essential advantage is flexible scheduling. Maintaining a healthy work-life balance can be chaotic with three small kids at home, but my career affords me ample vacation time to relax and decompress. My supervisors understand that I am a person with a family, not just a worker to fill a shift. They value me as an individual, and we work together to ensure that both the staffing needs and the needs of my family are adequately met. The opportunity for flexible scheduling makes the long hours much more manageable. When I deliver anesthesia, it’s encouraging to know that I’m helping patients to have better hospital experiences because of my care. Being the familiar face in an unfamiliar place is a great feeling. My role in the operating room definitely makes me appreciate what I do outside of the operating room, and vice versa! As I’ve developed my career, I’ve been given the chance to participate on several hospital committees, including Quality Improvement and Risk Management, and Infection Control. Additionally, I work as an adjunct faculty member for the Pitt Nurse Anesthesia Program. By teaching and developing the students that will be the future of this field, I’m able to stay sharp in my own professional skills and knowledge. Continued education, excellent pay and benefits, and exciting caseloads are just a few of the many rewards as a CRNA at UPMC! I hope my story provides insight and perspective about the many benefits of my specialty – a career at UPMC in Nurse Anesthesia is not a dead-end job, guaranteed! My co-workers and I strive for excellence every day, and I’m proud that we refuse to accept anything less. I love my life as a CRNA!